A consummate and innovative entrepreneur and fundraiser, by the 1950s Dr. J. Calvitt Clarke was running the world’s largest Protestant organization dedicated to the welfare of children. While Dr. Clarke’s life and accomplishments make him one of the 20th century’s foremost and beloved figures in philanthropy, his legacy is sometimes recorded with confusion, contradiction, and even outright error. 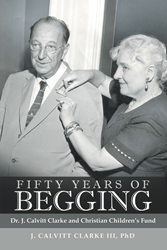 In “Fifty Years of Begging,” Dr. J. Calvitt Clarke III, author and grandson to Dr. Clarke, navigates the complexities of Dr. Clarke’s personality and intellectual life—including their contradictions—to offer a detailed and heartfelt profile of this compelling man. Based on hundreds of newspapers and extensive archival research—including a large cache of family papers—"Fifty Years of Begging” is inspired by Dr. Clarke’s own badly fragmented and scattered manuscript of his unfinished memoirs. While growing up, the author did not know his grandfather well. On the other hand, his work on his grandfather Clarke’s biography set him on an exciting and enjoyable road of discovery, one that would reveal Dr. J. Calvitt Clarke’s proud heritage and legacy of philanthropy and service. J. Calvitt Clarke III received his doctoral degree in Russian and Soviet history from the University of Maryland in College Park. He also earned a BA from Washington and Lee University in Lexington, Virginia and a MA from James Madison University in Harrisonburg, Virginia. Early in his career, Dr. Clarke spent significant time teaching aboard US Navy ships and at US military bases in Italy, Spain, and the Mediterranean. Once he returned to the States, he taught history for 18 years at Jacksonville University in Florida. Dr. Clarke retired as professor emeritus of history, and he has served on the board of directors for Children, Incorporated. He currently lives in Lexington, Virginia, with his wife, Mariko Asakawa. Together they have a daughter, Tiffany.